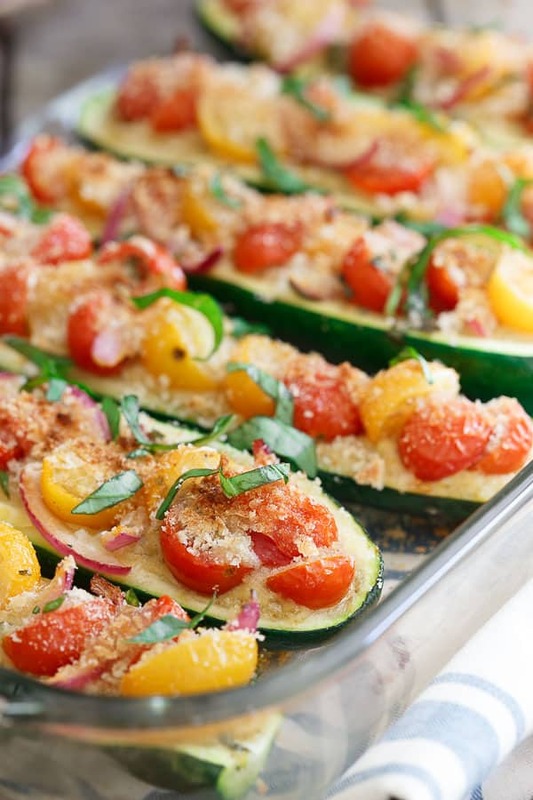 This hummus stuffed zucchini is topped with a simple bruschetta and toasted panko basil crumb. It’s the perfect side dish to enjoy all summer. For 5 years now, I’ve done the potted herb thing since I still don’t (and probably never will) have the raised bed garden of my dreams in the backyard (which, I might add is perfect for a garden). For 5 years I’ve put these pots on the front (south facing) steps and for every single one of those 5 years, the end of June/beginning of July has come and the cilantro is all but dead and the basil is woody and pathetic looking. It wasn’t until late last year (after there was no saving either plant) that I realized, hmm, maybe I shouldn’t put the cilantro and basil in the front with the sun and heat blasting on them all day long and try out the (north facing) deck in the back instead. Well, that’s exactly what I did this year and after only 3 weeks, my herbs are so out of control amazingly bushy and loving life back there despite the early summer heat we’ve had that I’m now actually panicking about how I’m going to use this much cilantro, basil and parsley. So with an overly ambitious zucchini purchase (I’m doing a 30 day paleo challenge with Julie this month and bought all the veg in sight last week), I decided to stuff them full of hummus and top them with a bruschetta mixture to start attacking the basil explosion on the deck. 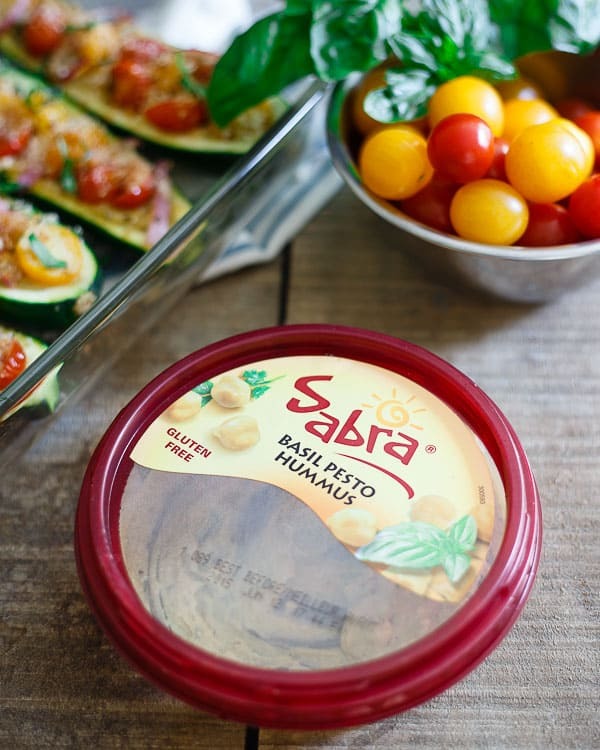 Thursday is National Hummus Day (yep, it’s a thing) and Sabra’s basil pesto hummus seemed the most fitting for this recipe. It’s crazy there are still people out there that don’t know what hummus is considering the quantities we eat in this house, but apparently you’re out there. Listen up, you hummus virgins…grab thee a tub, stop freaking out that it’s a bean dip and start by dipping a cracker or carrot in there. Once you’re hooked, which will be after the first bite, you’ll realize all the things you can use it for besides just snacking, like these hummus stuffed zucchini. Then, get to work on the recipe. 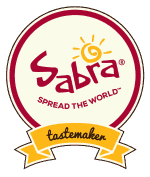 Sabra is celebrating National Hummus Day this Thursday (May 21st) with a coupon you can find here (<– note the coupon will only be up ON 5/21 so make sure to come back on that date). 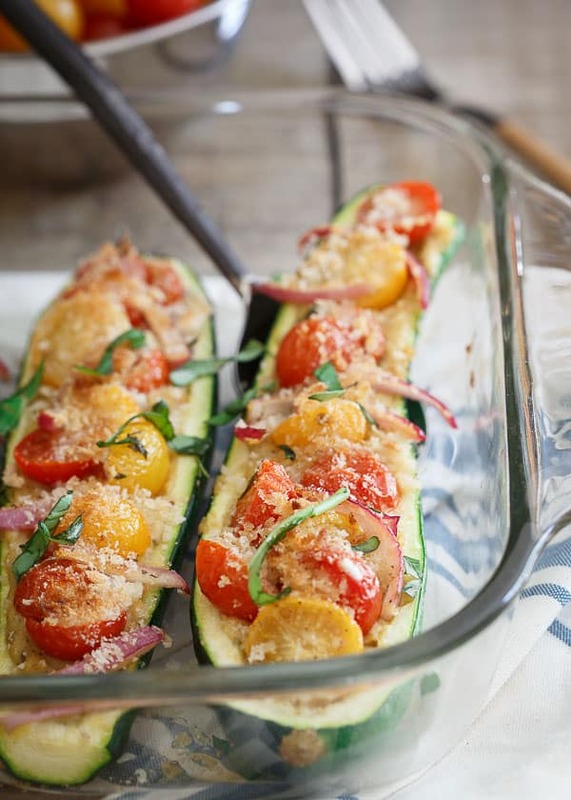 Place zucchini in a baking dish with a little bit of water on the bottom and bake for about 20 minutes, flesh side up until softened enough to scoop out the insides. Meanwhile, combine the tomatoes, onion, basil, olive oil, vinegar, salt and pepper in a small bowl and toss together. Hollow out the middle of each zucchini half once cooled enough to handle and discard flesh. Spoon the hummus (about 2 tablespoons per zucchini half) into the hollowed out cavity. Top with the tomato mixture then sprinkle the panko on top. Lightly drizzle the panko topping with more olive oil and return to the oven for about 10 minutes. Raise heat to broil for the last 2-3 minutes to just slightly brown the top. Sooooooo what you’re really saying is that you want me to come over and steal some of your herbs :) These stuffed zucchini are a nice twist with the hummus…so good! No carb bruschetta, seriously need this my life as my body has consumed entirely too many carbs in the last three days. Plus, these are gorgeous, which makes me want them even more! I can’t wait until my vegetables and herbs start going crazy…one of my favorite parts of summertime! These zucchini look amazing. This recipe appeals to me for so many reasons!! Zucchini and tomatoes are just coming into our farmer’s markets and have been so good — and hummus? Who doesn’t love hummus?! These are beautiful. Adding to my Memorial Day weekend menu! Since moving to New York, I have turned into a huge carb (bagels and challah bread, you kill me). This is the perfect low carb alternative to balance it out! Cheers! I am no stranger to hummus and love this idea to stuff it into zucchini. This summer when I have it coming out of my ears from my CSA, I’ll be making this over and over. Loooving this use of the basil pesto hummus! I planted a whole bunch of herbs this year. My fingers are crossed…. These sound delicious! I am loving all the bright, fresh flavors happening with this! :) And what a great way to use up those fresh herbs. These look wonderful. I love everything about them! This is arris oily a little bit of genius. I have a serious hummus addiction and I love idea of topping it off with that beautiful simple bruschetta. Definitely need to give this a try! Zucchini and hummus is the best combo. I made the pasta salad today, again, with zucchini. So good! I’m going to grill this recipe this weekend for sure! I stuff zucchini frequently and love the idea of adding the hummus. Will do very soon. I always scoop out the meaty insides of the squash and add to the other ingredients. Never waste good food! I can’t wait to try this new addition! Thanks for the idea. Once you’ve made your own hummus, you won’t be able to settle for store bought and will reduce your sodium intake as well. And as far as extra herbs, I make my own pesto with a variety of herbs or even greens and freeze in ice cube portions for later in the year. Well worth the effort for both, and easy with a good food processor. I like the recipe very much the only thing I had to change is using my home made hummus . Great idea to use homemade! This was great! We had Sabra’s original hummus on hand, so I used that. But, it came out delicious! My husband was in heaven and so was I. The only thing is my husband took leftovers into work the next day and said that the hummus had a mayonnaise consistency at lunch, and he wasn’t able to stomach it. So, I recommend making as much as you need and eating it right away unless you like that mayonnaise consistency. 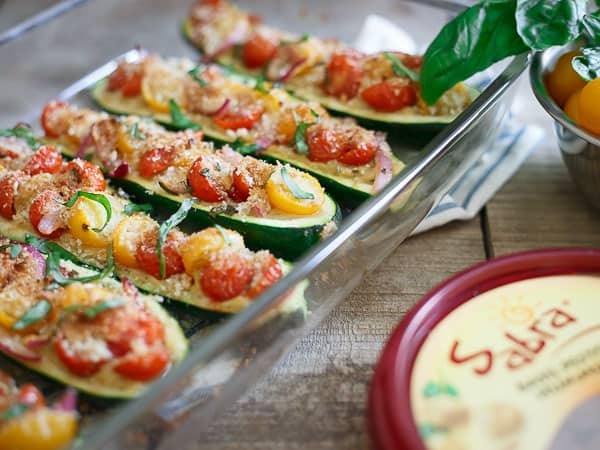 I’ll definitely try bruschetta hummus stuffed zucchini! Hope my husband would love it! Thanks for sharing! Can i post it on my blog? 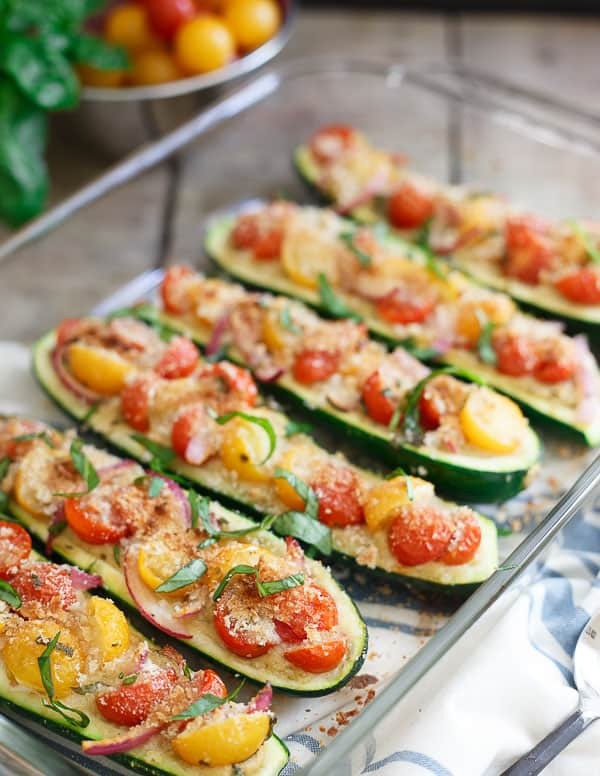 This bruschetta hummus stuffed zucchini absolutely something new for me! Looks yummy! I’m also gonna pin this post on my Pinterest board my followers will love it. Thx for sharing recipe, I definitely add it to my cookbook! I couldn’t find basil hummus at my grocery store. I considered making it, but know time will be short in the dinner hour. I bought hummus and basil pesto. I think we will try some hummus, some pesto, and some mixed. Do you know where I can find it or was it 2015 limited edition flavor and no longer available? I don’t think that flavor exists any more – they change them quite often! I think your plan sounds great!